I think what I like most about decorating for Christmas and is looking around and taking stock of all the little things I enjoy. I do love how it's a real treat to only get to see everything only once a year, and bringing back old memories of Christmases and loved ones past makes it even better. Like the Dream Pet mouse ornament reminds me of my grandparents' and parents' trees, and while I'm not an angel or star tree topper gal, I LOVE finial tree toppers (that's what we had when I was a girl). 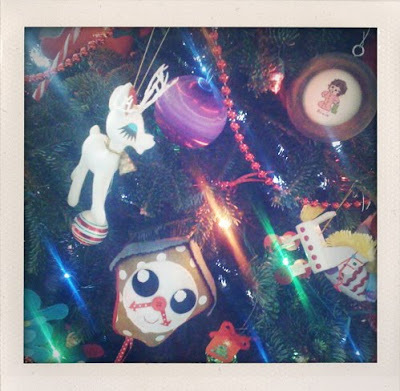 And that little paper mache angel was on our tree when I was growing up, too. reminds me of the cherub, Tillie, in Nestor the Long Eared Christmas Donkey (I love Nestor!). 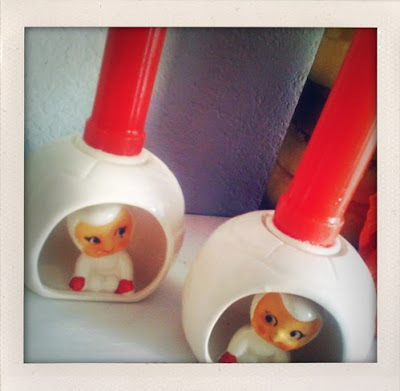 So, I thought I'd share with you a few of my own favorite Christmas things -- some home made, so traditional, and some are new finds, but I love them all and they make me just a smidge merrier. These little igloo dwellers were a thrifting steal, and I'm so fond of them, they've become a Christmas staple! So! Adorable! 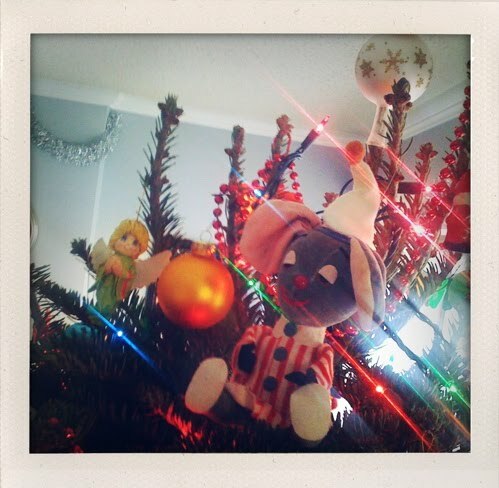 And I know that everyone loves knee hugging elves (you must check out Heidi Kenney's, by the way), but this is one particularly special to me, being the only ornament I have that was once my grandparents. It gets a special spot at the front of the tree. I might also add, it's not a Christmas tree round here without some beaded pipe cleaner candy canes! Growing up we had a fabric wreath, similar to this one, that I loved (probably from Vogue pattern 1312). Being displeased with my other wreath attempts that just weren't 'me,' I made this one up out of Christmas fabric, ribbon and felt to capture the feeling of the one we had long ago. It's totally one of my favorite Christmas things now -- so cozy and festive! Speaking of Heidi Kenney, there's one of her plush cuckoo clocks! 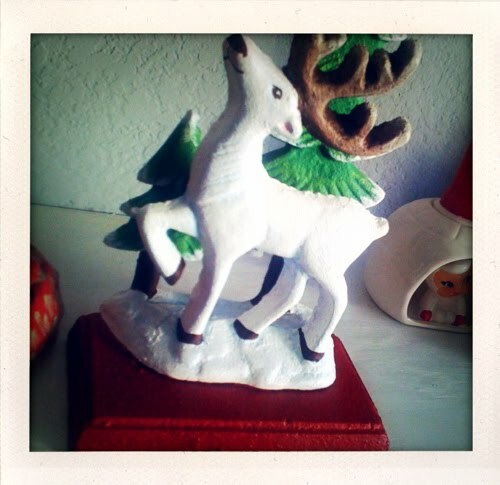 It's hanging out with some of my favorite childhood ornaments, namely 'the pretty reindeer' who is flocked white plastic (she's sooo pretty! At least I always thought so!) and a counted cross stitch li'l Alicia portrait my mom's friend made me when I was a wee thing (I love li'l Alicia's pink footie pajamas). 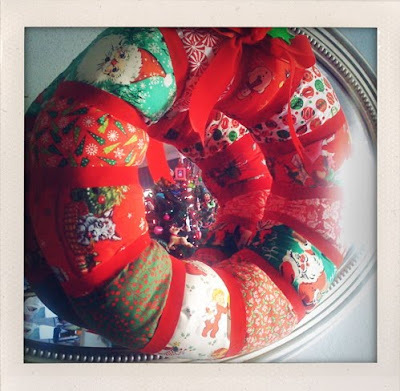 And straight from the same Vogue 1312 patterns as the stockings, is the Christmas tree skirt! It's the same pattern we had for our tree skirt growing up, which makes me very happy (much gracias to my aunt for sending me the pattern!). This is only a portion of it, but it's one of my favorite sections of just the cutest Japanese fabric. 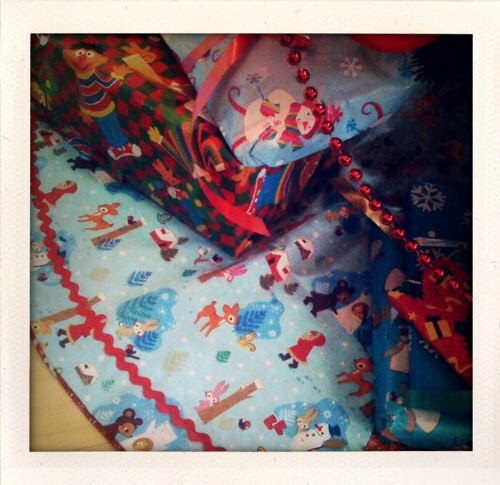 And you can't beat some Elmo-free* Sesame Street wrapping paper enveloped presents (Bert & Enrie only! Wow, it's like it's the 80's again!) and red tree garland (swoon). 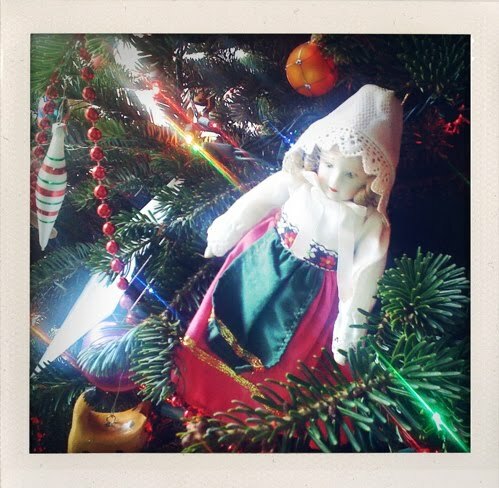 This doll ornament is a favorite of mine -- I remember my mom let me pick it out as my own ornament. 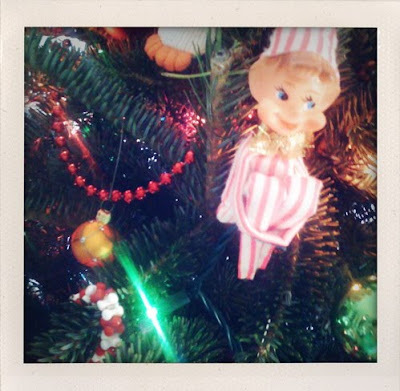 I was so doll obsessed as a little girl, so it only makes sense that of all the ornaments I could pick, I'd pick a doll. But she is sweet, isn't she? And I've never been one for stocking hangers, but I am verboten from hammering holes into the mantel. I found the heaviest cast iron stocking hangers I could find, but had to repaint them to be more festive and Alicia-esque -- now they remind me of vintage cast iron toys, and I love that! They might just have to become Christmas tradition, mantel holes or not. So that's a small sampling, if you can believe it, of a few of my favorite Christmas things. here's hoping your favorite Christmas things cheer you up as much as mine do me! Awww, thanks, Beard and Bear! I'm sure Rosemary (a beautiful name) will cherish whatever Christmas memories you make together over the years! It's finally here -- Blue Genie Art Bazaar!